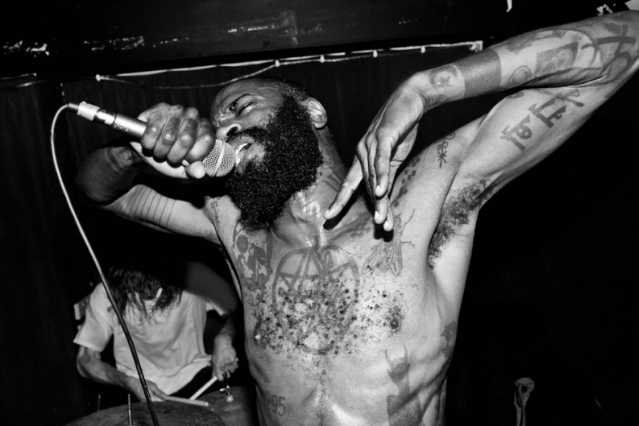 Hear Death Grips’ Latest Release: An Insane Wall of Gifs! Deliciously grating noise-rap trio Death Grips are just weeks away from releasing their major label debut, The Money Store and the run-up has been intense: the explosive “Lost Boys”, the wubbing nuclear cloud “Blackjack”, the spazzy freak-out “Get Got”, and the scum-flecked headbanger “Fever (Aye Aye)”. Now the band’s latest release, a collabo with the Creator’s Project, is a wall of 109 gifs means to be played all at once in clusterfucky fashion. Watch this mess at the band’s site. “Play All” unleashes a storm of Merzbowian levels; poking around reveals little treats (our favorite is fifth row down, ninth column over).